Scott Snyder concludes the opening story arc in the latest issue of Justice League. He does bring it to a strong and definite end, and yet at the same time uses this to set up some forthcoming stories as well. 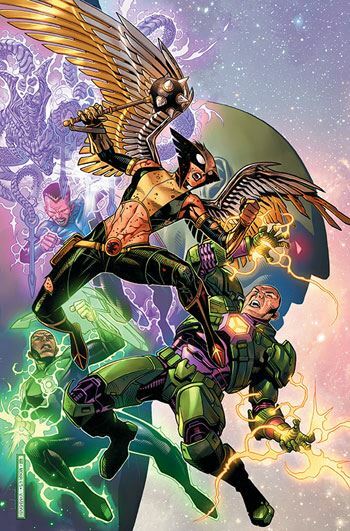 There are some very good scenes along the way, the fight between Hawkgirl and Luthor is particularly intense. But what really stayed in my mind after reading the story was not the big conclusion, but some sequences from the epilogue. There is a major villain brought in on the last page, and some developments with the heroes in the League. The story also seems to set up Justice League Odyssey, which had been shown in the last issue of No Justice, but not mentioned since. Some of the heroes from that team show up in this issue, and I believe the Martian Manhunter’s plans will be launching point for that series. But this is one of those reviews that really frustrates me. The most important scene in the book involves the (possible) return of a familiar character, and I simply will not spoil it by revealing who that it. I will restrain myself to commenting that the costume does not match the weapon, which makes me wonder just which incarnation this is, or if it is an entirely new character with a familiar name. All in all, this was a really great opening story arc, one that achieved the level of fun and drama that Justice League always ought to reach. The only complaint, and it’s a minor one, is that I wish Cheetah and Black Manta had been used a bit more than they were. But that is far outweighed by all the good things in this issue, in this storyline. And the excitement I feel about upcoming issues, and the explanation of who their mysterious visitor will turn out to be.